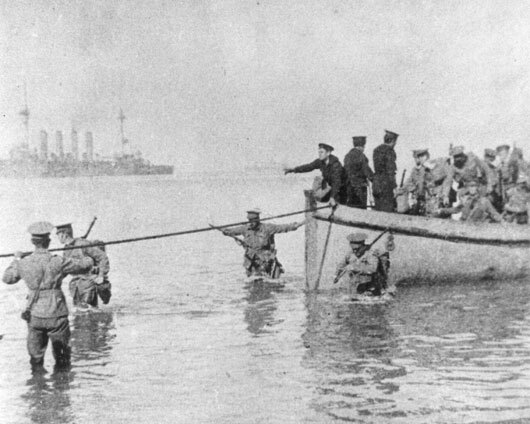 When Turkey entered the First World War on the side of Germany, the Allies hoped to penetrate the Dardanelles by sea, capture the capital of Istanbul, and thus keep open the supply routes to Russia through the Black Sea. 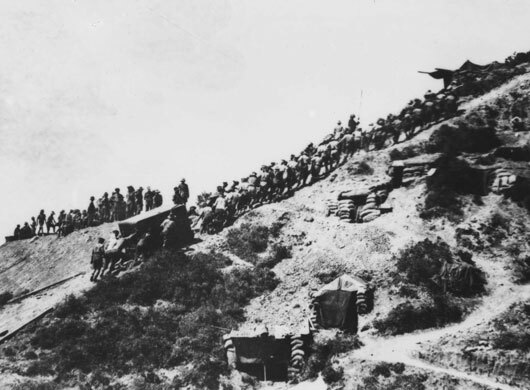 When this proved impossible, the Australian 1st Division and the New Zealand and Australian Division were deployed as part of an Allied invasion of the Gallipoli Peninsula. For months stubborn Turkish resistance held the invaders close to the landing sites. A second offensive in August proved no more successful, and so after eight months on the peninsula the Anzacs withdrew in December 1915, as part of an Allied withdrawal that was completed a month later. This was the first major battle for the Anzacs and the new nation of Australia. The feats and the sacrifices of the Anzac soldiers are commemorated in Australia and New Zealand each year on the anniversary of the landings, the day that has become known as “Anzac Day”. In Australia, the day has also come to symbolise our sense of nationhood. The Anzac legend was born at Gallipoli on 25 April 1915. A view of Anzac Cove looking north toward New Zealand Point (AWM P01130.001). 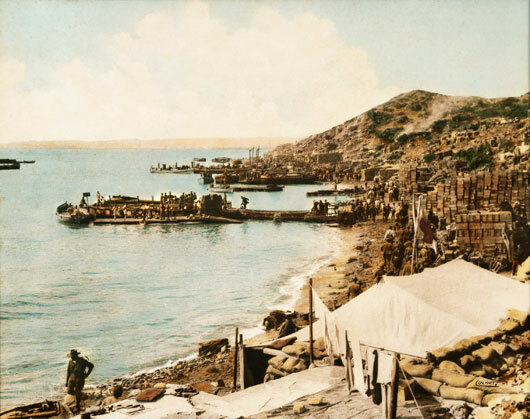 Troops and stores on Anzac Beach, 1915 (AWM H03500). 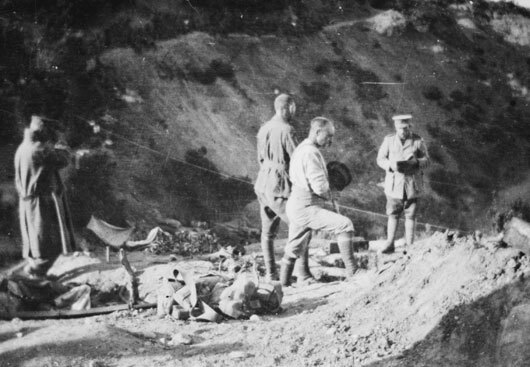 Padre McKenzie of the 4th Battalion AIF, burying a soldier in Shrapnel Gully (AWM H15688). 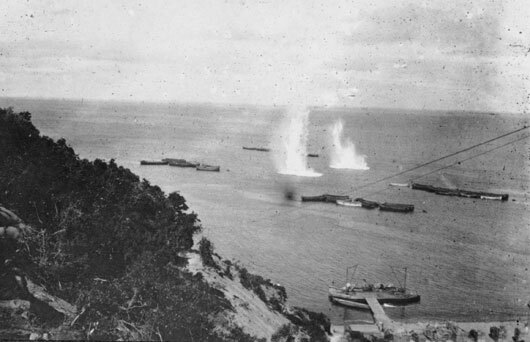 Looking seaward from the heights above Anzac Beach, Turkish shells burst in the water close to Australian Army boats (AWM H03569. 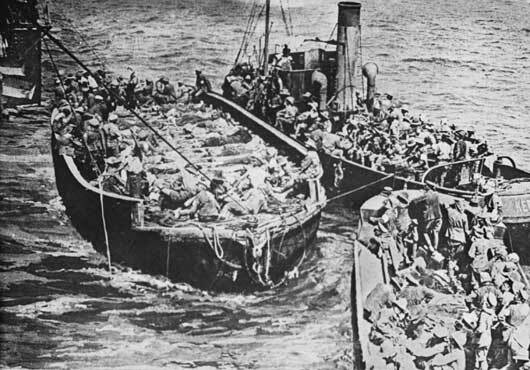 Evacuation of the wounded from Anzac Cove on barges (AWM C02679). A fatigue party of Maori and Australian soldiers dragging a large water tank uphill from Anzac Cove (AWM C01812). 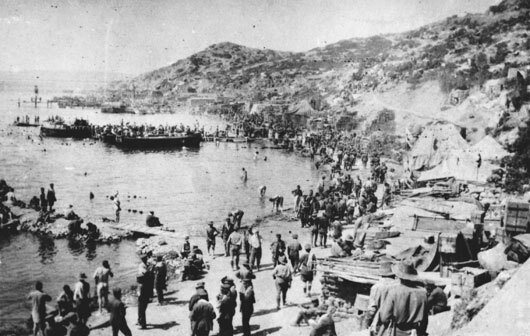 A tie line being secured so troops can disembark on the day of the landings at Anzac Cove (AWM A05292). 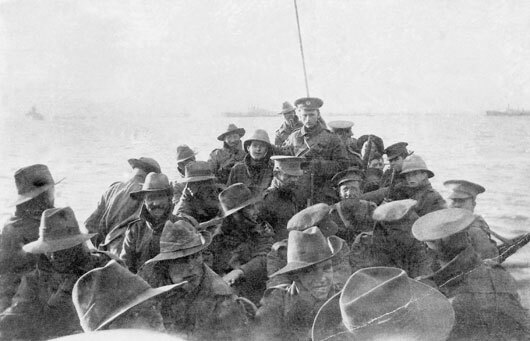 Unidentified men of the 1st Divisional Signal Company being towed towards Anzac Cove at 6am on the day of the landing (AWM A02781). 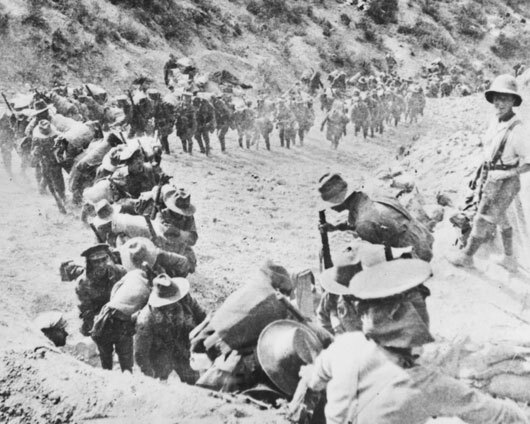 The 21st Battalion marching up Monash Gully after arriving at Gallipoli (AWM A00742).